Season Outline: Rayna Jaymes (CONNIE BRITTON) is the Queen of Country, but there’s a new “royal” on the rise. Juliette Barnes (HAYDEN PANETTIERE) is a hot, young diva poised to known Rayne off her throne — both on the charts and in the heart of Rayna’s lead guitarist and former lover, Deacon Claybourne (CHARLES ESTEN). Meanwhile, another sultry love triangle heats up when Deacon’s niece Scarlett (CLARE BOWEN), a budding singer/songwriter, is torn between her boyfriend Avery (JONATHAN JACKSON) and her writing partner Gunnar (SAM PALLADIO). Adding more fuel to the fire is Rayna’s rich, scheming father (POWERS BOOTHE), whose political ambitions for Rayna’s husband hid sinister ulterior motives. “Nashville” Comes to Nashville (6:09) is a short featurette about the series shooting on location in Nashville and the great places they get to film in. Stellas Go on “Tour” (8:41) – This featurette provides a tour of the set by sisters Maisy and Lennon Stella. On the Record: B-Side (5:02) are introductions rising country singers and songwriters featured in the series. Rounding out the features are some Deleted Scenes (6:54) and a Bloopers (2:09) reel. The strong point of the Dolby Digital 5.1 track is obviously with the music which shines through while the dialogue levels are also crisp and clear. 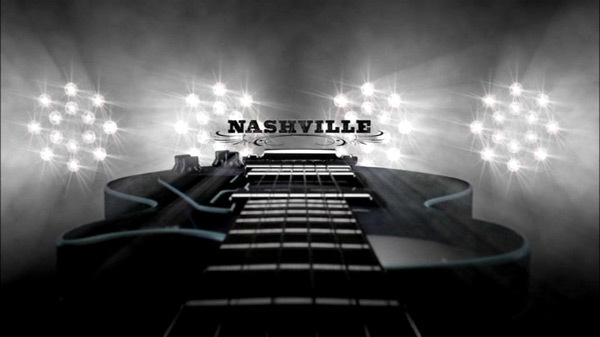 Overall, “Nashville” is not my cup of tea when it comes to music as I’m not much of a country music fan, however, the drama is engrossing and the performances are well done headlined by Connie Britton who really shined on “Friday Night Lights” and continues to do so in this series. The 5-disc DVD set has solid audio and video but the features are lacking yet if you enjoy the show, its well worth picking up.